Last day in Grenoble. We went to buy supplies from the food hall Sainte-Claire Les Halles and the outside market. 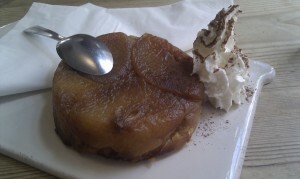 We decided such exertion deserved cake and some we went to Pain et Cie to share a Tarte Tatin and check out the wifi connection. The internet is quick and free and the cake was delicious. After chilling out in the garden at Citdines we headed back into town to the Musée De L’Ancien Eveché where we borrowed free audio guides in English and wandered around. This time we went underneath the old palace to see the remains of the Roman wall and the 4th century Baptistry which you can see marked out on the pavement in front of the museum and the cathedral. If you’re looking for a quiet spot in Grenoble to drink tea and surf the web then check out or Grenoble Life which as a review of some of the good places to get wifi. This entry was posted Sunday, July 18th, 2010 at 11:08 pm	and is filed under Cafés, Museums, Shops. You can leave a response, or trackback from your own site.